At 86.7 in December, the main consumer confidence index reached its lowest level since October 2014. The large drop in purchasing intentions that was measured in November continued in December, with intentions reaching their lowest level since June 2013. 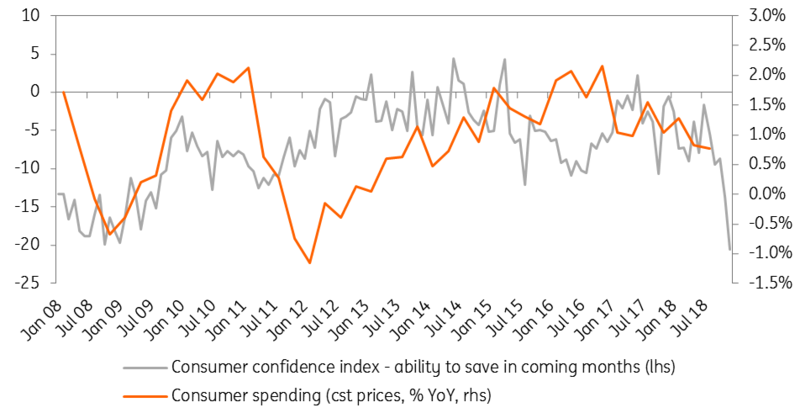 The second largest change in the survey was measured in households’ sentiment in relation their ability to save, which had been restored in the first half of 2018. Lastly, despite the fact that unemployment continued to decline in recent months, fears of unemployment – which made a two-year jump back in time in November – continued to increase in December, although the rise was limited. The survey therefore shows an abnormal level of anxiety among French consumers: their sentiment about their ability to save is worse now than at any point of 2008 and 2009, while the current economic slowdown has nothing in common with what was seen at the time and despite the fact that purchasing power per household has increased by 1.4% in 2018 (Source: Bank of France) after a cumulated 3.7% between 2013 and 2017, which was admittedly weak (two times slower than real GDP). However, this high level of anxiety will have a lasting impact on consumption long after the short-term shock of the ‘yellow vest’ crisis is over. Consumer spending was already contracting in November and purchasing intentions in December clearly show another negative month. Private consumption could, therefore, contract slightly in 4Q18, leading in 2018 to the weakest private consumption growth since 2014, at 0.9%. 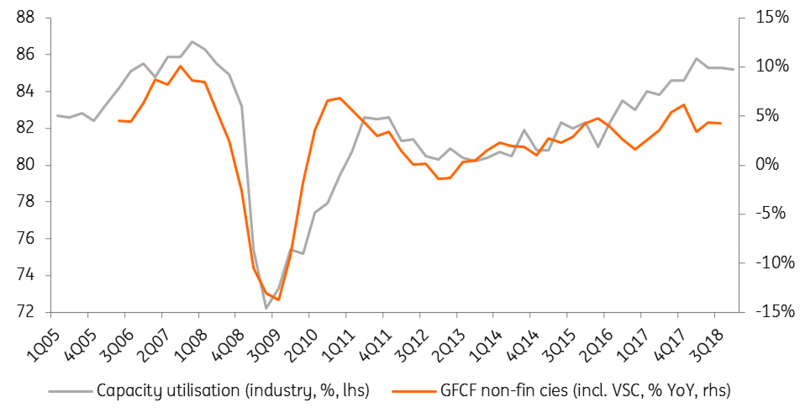 In 2019, private consumption should catch up on the back of lower energy prices, lower unemployment and higher purchasing power (the Bank of France expects it to rebound by 1.8% this year). However, we expect the rebound to be limited by the current level of anxiety, which we believe will feed saving behaviours rather than consumption in the coming months. We, therefore, revise our private consumption growth forecast from 1.5% to 1.1% this year while unemployment should drop to 8.5% in the course of this year. 2019 should indeed be – with 2018 - the second year posting a decline in the unemployed population (all categories included, so outside the subsidised jobs effect) since the beginning of the crisis. The main strengths we are still seeing at the moment in domestic demand come from the current level of business investments. Industrial surveys are showing that despite a decline in the economic outlook, capacity utilisation did not decline significantly in the fourth quarter while export order books remain well filled. The catching-up effect in the automobile industry should also support manufacturing in 2019: even if we do not think that car sales will recover to their summer 2018 level anytime soon as diesel car prices are durably affected by the new European norms, it does not mean that the situation cannot improve at all. Corporate investment growth should, therefore, decelerate only slightly in 2019, to 3.5%. Household investments should, on the contrary, remain subdued after a very weak second semester of 2018 despite low-interest rates. This is why we expect a deceleration in investment growth from 2.8% to 2.5% between 2018 and 2019, and to 2.2% in 2020. Lastly, global trade growth should decelerate again in 2019 on the back of weaker economic trends in the US and China and a peak in German exports. French net exports, which benefited in 2018 from the weakness of domestic demand for imports and a relatively strong external demand despite the euro strength (outside the EUR/USD story, the effective euro exchange rate reached a peak this year), should again weigh on growth in 2019 and 2020. 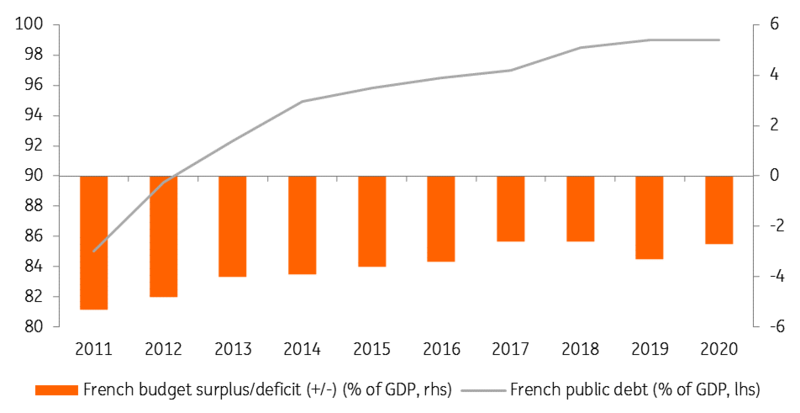 Adding the effects of lower GDP growth to a higher deficit in 2019, it is unlikely that France will have a deficit below 3% in 2019. In fact, the 2019 budget was already impacted by the recovery of SNCF's debt and the transformation of tax credits for competitiveness into lower charges: it was already forecast at 2.9%, close to the limit. This should be exceeded, the deficit reaching 3.3% and the debt nearing 100%. Nevertheless, we believe that the downward trajectory will be maintained. In the coming months, the government should detail corrective measures aimed at reducing public expenditure. We, therefore, maintain a deficit forecast of less than 3% in 2020, or 2.9% instead of the previously expected 2.6%. If the shock were to be temporary, the least we can say is that it is ill-timed at the European level. Italy has indeed been forced to review its budget to avoid a new excessive deficit procedure, a procedure that France itself officially ended only last June. Both situations are, however, far from comparable since even the blip of 2019 does not put into question the trajectory of the French public debt, which should decrease in the coming years. If we think that the debate around a new Excessive Deficit Procedure for France is largely exaggerated, it remains that this makes France’s position on eurozone reforms more difficult to hold. So long as President Macron shows that France cannot be reformed, the rest of Europe, especially in the north, will not be ready to support risk sharing or tax transfers among eurozone members. The small steps that were endorsed in December by the European Council in terms of the EU budget and the Banking Union, and which acknowledged some French demands, may, therefore, be the last for a while.